MARSHALL, Mich. - Within the last few years, southern Michigan has begun to try to catch up with the rest of the state in terms of the number and quality of golf courses. 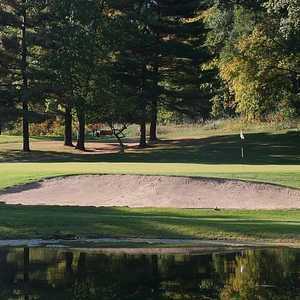 The Medalist Golf Club in Marshall, Michigan is one of the most promising southern courses, offering a wonderful alternative to the more expensive--and more crowded--Lansing-area courses. 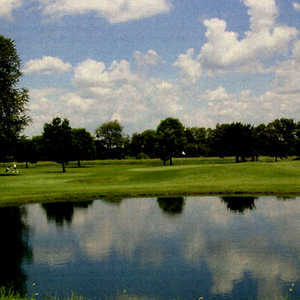 The course was designed by Bill Newcomb, with the front nine opening in the fall of 1996 and the back nine in the spring of 1997. It still needs to mature a bit, but all of the pieces are in place already. The clubhouse is large and boasts a gorgeous view over the 18th hole. The driving range and practice green are more than sufficient, although the range presents some problems for the 2nd and 3rd holes, as I will discuss momentarily. Other impressive amenities are speedy golf carts fully equipped with tees, towels, windshield, and even a cooler. If that cooler were stocked with cold beer, you might never pull me off the course. Sadly for me (but happily for my liver), you'll need to provide your own beverages from the clubhouse or drink cart. Another great feature is that your greens fee includes all the balls you care to hit on the practice range to warm up--an absolutely splendid idea! Why don't more courses adopt this policy? A personal note before continuing: As I have mentioned in previous reviews, I like for a course to display the characteristics suggested by its name. So when, for example, I saw a hawk at Hawk Hollow, I was pleased. So what do I want to see at The Medalist? Kerri Strug hobbling around on her bum ankle? Carl Lewis long-jumping into sand traps? Sure, that would be ideal, but no such luck. The Medalist logo is an egret stalking through a marsh, and in fact, there are plenty of marshes on the course--ball-eating, score-ruining marshes. So, while I saw no actual egrets (or Olympians), The Medalist gets a passing grade on my own little realism scale. On to the actual course, there are two major keys for the first-timer at this course. One, check the day's pin placement in the clubhouse (positions 1-8), and then refer to the pin placement chart for each green on the score card. The greens contain lots of subtle, vexing breaks, and are very large, so being close to the pin is crucial. Two, do not let the first three holes bum you out. In no way do I intend to be mean-spirited or snobbish, but if you don't know what the rest of the course holds, the first three holes might make you think that you've misspent your $40 greens fee (plus $15 for a cart). Believe me, the course gets much, much better as you go. I'm not sure why the first two holes are in such bad shape. Perhaps it is due to the dry weather. Perhaps it is simply because the course is relatively new. It may also be that they have been reworked recently for drainage or some other reasons. Whatever the case, No. 1 is very rough, with hardpan lining the fairway, many brown patches in the fairway itself and on the large green and dirt paths running along the right side (not cart paths, either). The second hole, another par 4, is a bit greener, but the fairway runs along the driving range. Consequently, there were literally dozens of range balls in the fairway. Fortunately, my photographer and I carried our tee shots past the clutter. But if the range were busy and you were to hit a short drive, you'd spend ten minutes identifying your ball. This shouldn't happen in the middle of the fairway! I'm not even going to mention the danger posed by such a layout. No. 3 is a long (202-yard) par 3, and in contrast to Nos. 1 and 2, is very pretty. The tee is elevated and you need to carry a pond and a large bunker guarding the green on the front right. Left is death, or possible death, anyway, as range balls zing through the meager trees which ostensibly protect players from long hitters on the range. Let me tell you that the trees don't work; there were even range balls in the bunker on the front right of the green and on the green itself. My photographer was nearly hit on the fly while addressing his second shot, just left of the green. Obviously, some sort of net or fence is required here and on the second fairway. Beginning at hole No. 4, a 568-yard par 5, the course steadily improves. The 4th requires a long and precise blind tee shot over a ridge. O.B. looms on the right. The perfect tee shot leaves you a very daunting second shot over a swamp on the right side of the fairway. One of my greatest achievements of the round was not losing a ball here (I more than made up for it later, though). Par this number one handicap hole, and you've got bragging rights for the day. The par-4, 400-yard 6th begins with a lovely tee shot out of a chute of trees. The fairway is dotted with sand traps, and there is one huge, steeply faced trap left that pretty much forces a backwards shot to get out. When you hit the par-3, 172-yard 7th, you finally know that your money has been well spent. In fact, at the risk of sounding overly effusive, I will say that this hole is one of the best par 3s in mid and southern Michigan. In order to hit the shallow, wide green, you have to carry over an enormous expanse of brush and brambles and a huge bunker front right. Standing on the elevated tee, you have a view over treetops of a lake in the distance. And, to be quite honest, the green seems just about as far away as that lake. There is no way that this hole can be only 172 yards. We hit a couple of balls each with increasingly longer clubs and never did carry it to the green. Next time, I swear I'll use a 3-wood. No. 9 is home to the only water fowl we encountered--not egrets, but swans. Either swans or the biggest gosh-darn mutant geese ever. I've played in Florida and perhaps wandered a bit too close to alligator ponds to save a stroke or two. But let me tell you, swans are at least as mean as gators. So try to steer clear of the marsh running all along the left-hand side of this 565-yard par 5. The green here, as on nearly all the holes, is big. Some greens, in fact, are gigantic. I don't know about you, but I find 30-yard lag putts intimidating. While we're talking about greens, one word of caution: Despite the overall high quality of the 4th through 18th holes, the greens were generally in poor shape. Most distressing were the half-dozen or so whose ridges, contours, or humps had been very badly scalped by mowers. Not only was the grass dead, but you could actually see where the mower blades had gouged into the dirt. We'll hope that once the mower drivers get more practice, conditions will improve. Until then, expect that some putts will be knocked off line by rough spots. Nos. 10 and 11, two 400+ yard par 4s, offer spectacular and exacting tee shots. On the dogleg left 10th, a big hit to the right of the big tree in the marsh, or an even bigger hit to the left of the same tree, is perfect. The 11th demands a long carry over a marsh to an elevated fairway. A beautifully sculpted bunker awaits long wayward drives to the right. The woods on the left guard the long, 3-tiered green from all but the perfect lie on the right-hand side of the fairway. The 14th hole is not a difficult par 4 at 379 yards, unless you hit a drive that is too perfect. There is a medium-sized blue spruce growing squarely in the middle of the fairway about 280 yards from the tee. The ideal place to aim your drive, then, is right at it. Remember David Duval on the 18th hole during the "Showdown at Sherwood?" He aimed at an island of rocks and trees in the middle of that fairway, thinking he'd never hit it. Well, if your tee shot here is your best shot of the day, as it was mine, and you've aimed at that damnable little tree, you'll be directly behind it. There is something so wrong about an unplayable lie in the middle of the fairway...but don't get me started. The 350-yard 16th requires a decision off the tee. The fairway is split, with a "high road" on the right, and a "low road" on the left ("...and I'll get to bogey before ye..."). Between the two is a steep, rough-covered bank and a bunker. The high road offers a better angle at the pin, but runs tightly along thick woods. You must know your own shot-making ability (or lack thereof) here. The green is one of those monstrous ones-about 35 yards long. So check the pin placement. No. 17 is a dramatic par-3. The green is quite a bit higher than the tee, and you need to carry a swamp again. More importantly, it appears as if a chunk of space debris impacted directly in front of the green. If you don't carry this bunker, you'll need to hit a lob-wedge out of the bunker about 15 feet straight up into the air to get onto the green. I'm not exaggerating. One last fun fact about this hole is that the ladies' tee is actually an Astroturf mat placed just off the left side of the plank catwalk running over the marsh. Last but not least, the 18th is one of the most aesthetically pleasing finishing holes in mid/southern Michigan. The tee shot is once again over a marsh to an elevated landing area. If you don't make the top of this ridge, you'll have a blind second shot. A pond guards the green on the left, so aim right, especially if you are shooting blind. The green is the best one in the course in terms of condition, and it is nestled up to the back of the clubhouse, just below the broad patio. So after you've tallied your strokes (a long process for some of us) and your lost balls (an equally long process for some of us), you can retire to the patio for a cold drink and watch balls plunk into that pond. At 6,965 yards from the tips and 6,490, 6,007, and 5,240 from the other tees, The Medalist challenges every level of golfer. Some of the holes look totally different from the forward tees than they do from the back. And just 35 minutes south of Lansing, The Medalist is poised to steal business from the ever more crowded Lansing area courses. Once word gets out and the course matures, you can expect to find The Medalist on future lists of the top public courses in the southern half of the state.